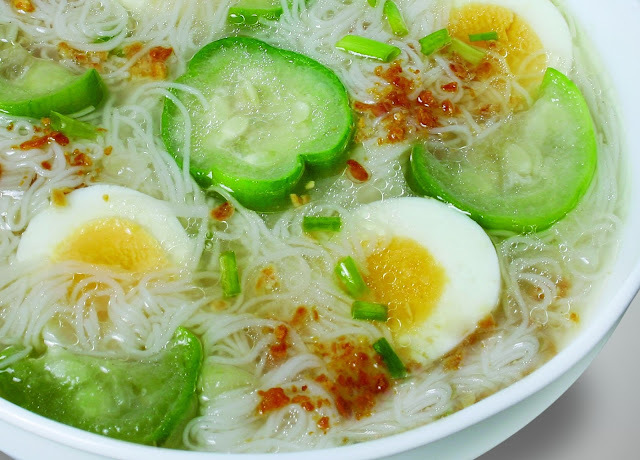 Soups are best served during rainy season in the Philippines where the weather is cold and may thus be regarded as local comfort food. Usually sardines or shrimp is added to give more flavour to the soup. 1. Sauté the garlic until brown and add the onions. 2. Put the pork, sauté for 2 minutes then add in 4 cups of water. Cook until pork is tender. 3. Once the mixture starts to boil, add the patola and stir for another 2 minutes. 4. Add the 2 thin rolls of Sapporo Misua and simmer. 5. Serve hot with sliced egg on top.